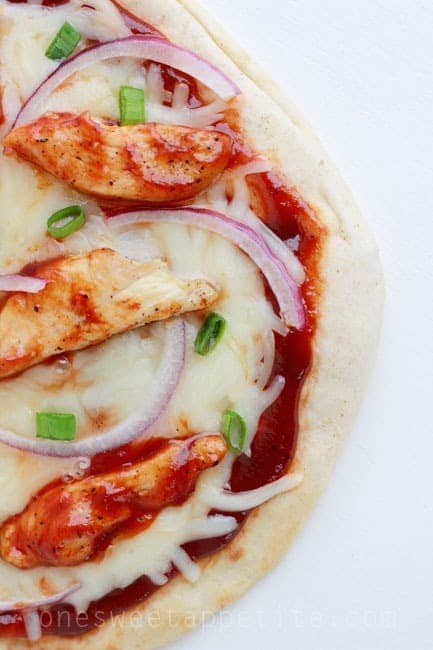 My friend Yvonne won me over with this quick pita pizza idea… I am on a roll creating flavors. First was my chicken alfredo version and now this barbecue chicken pizza! I was a little hesitant about this combination at first. Barbecue sauce on a pizza just sounds… odd. 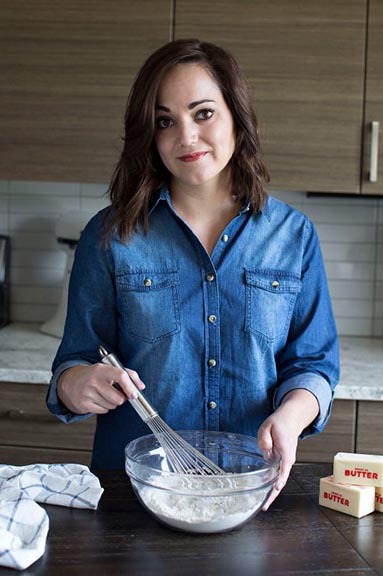 I think I once even made fun of a friend who ordered something similar while out on a girls night, but I had some leftover chicken that desperately needed to be used up and nothing in the fridge except a giant bottle of Sweet Baby Ray’s. Using a flatbread as the base instead of actual crust cuts your time in half and it’s the perfect size for one person. Or maybe two if you feel like not stuffing yourself silly. 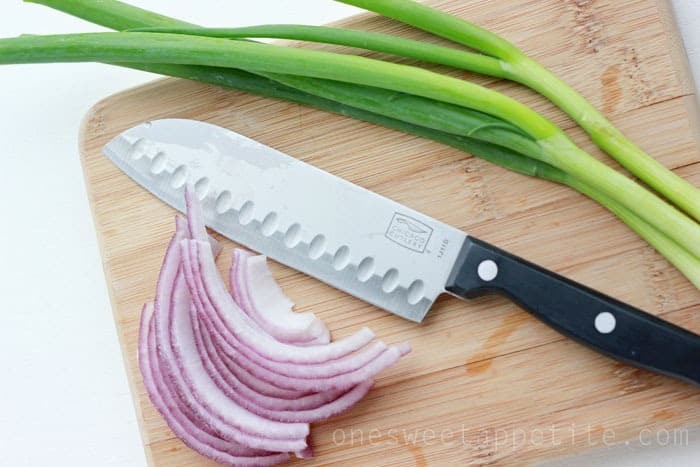 I decided sweet onions and maybe a few green would be the perfect addition to give this pie an extra boost of flavor. I really love that the total prep and cook time for this dish was UNDER 20 minutes. That’s perfect for a quick lunch or busy weeknight meal. While this version was delicious, next time I think I’ll switch the green onions for cilantro. Give it that pretty green element and add some great flavor at the same time. The bbq sauce surprised me by not being too overpowering. The chicken and onions blended together to form a mouth full of goodness in every bite. Start by preheating your oven to 425 degrees. Line a cookie sheet with foil for easy clean up. Place your flat bread onto the foil lined tray. Spread a thin layer of sauce up to the edge of your pita. Cover the sauce in cheese and the rest of your ingredients. Bake for 8-10 minutes or until the cheese is melted and your pizza is heated through. YUMMY! Oh my goodness! Simple and delicious. Can’t get much better. I love barbecue chicken pizza! This looks amazing! Pinning! 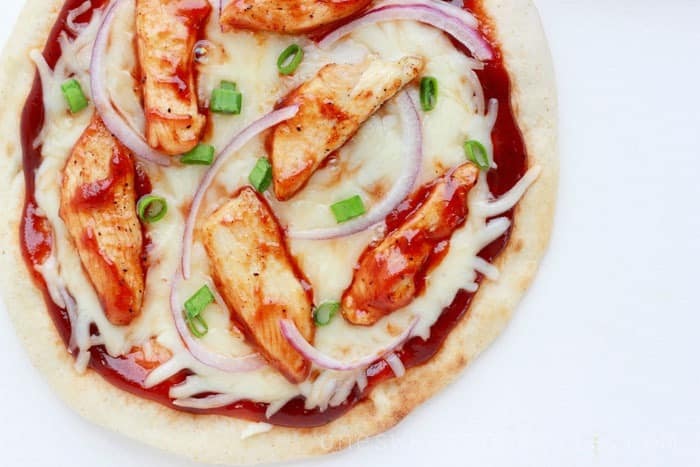 Mmm, bbq chicken pizza is actually one of my favorite ways to eat pizza. I have made pita pizzas before, but not in a while. I forgot how easy and convenient it is and I think I need to get back to it. Ps. Cilantro on this will definitely be a yes – and you should try adding a little bacon next time too. YUM! 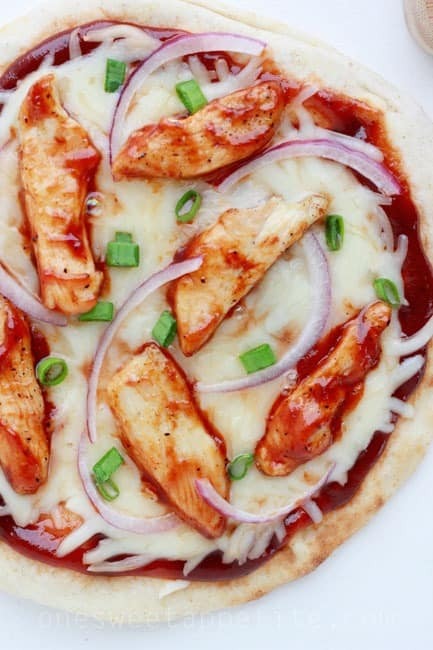 We make bbq chicken pizza all the time! It is my hubbys fav and my kids love it too! We use cheddar cheese though. Love the idea of using a pita! This looks amazing! I am normally a little leary of BBQ pizza, but I am GOING to try this, I even have pitas! Yum! Simple and easy. My kind of dinner. Thank! I LOVE making homemade pizza! You’ve just inspired me to add it back to the menu. It is John’s very favorite!